Our laboratory demonstrated that infection with the murine retrovirus LP-BM5 results in increased numbers of monocytic myeloid-derived suppressor cells (M-MDSCs) and that these M-MDSCs suppress not only T but also B cell responses. Because of the paucity of studies regarding the effects of MDSCs in general on B cells, we focused on these understudied B cell targets for M-MDSC effects on B cell phenotypic and functional parameters. M-MDSCs specifically decreased the proliferation of transitional type 2 (T2) B cells in response to polyclonal stimulation but increased germinal center and Ab-secreting B cell proportions and class-switched Ig production. Additionally, M-MDSCs inhibited the expression of CD40 and MHC class II on stimulated B cells and suppressed Ag presentation to Ag-specific CD4+ T cells. These alterations of the B cell compartment coincided with decreases in aerobic glycolysis, mitochondrial respiration, and glucose consumption; the latter specifically decreased in the T2 subset. To compare B cell targets of ex vivo M-MDSC suppression with the status of B cells during the course of LP-BM5–induced pathogenesis, including immunodeficiency in vivo, B cells from LP-BM5–infected mice were collected and analyzed. LP-BM5 infection resulted in several analogous alterations of B cells, as were observed with retrovirally expanded M-MDSC suppression in vitro, including decreased proliferation of T2 B cells, an increased proportion of germinal center and Ab-secreting B cells, increased production of class-switched Abs, decreased expression of CD40, and decreased metabolic activity upon stimulation. Myeloid-derived suppressor cells (MDSCs) are myeloid lineage cells that have been heavily studied for their ability to dampen T cell–mediated immune responses in human cancer patients and murine tumor models (1–6). We demonstrated that LP-BM5 murine retrovirus–infected mice exhibited a 3-fold increase in numbers of monocytic MDSCs (M-MDSCs), which are 4.5-fold more suppressive on a per-cell basis than cells of similar phenotype in naive, uninfected animals, resulting in a more than 12-fold increase in the total suppressive activity per spleen (7, 8). These LP-BM5–expanded M-MDSCs suppressed proliferation, IFN-γ, and IL-10 production of T cells in response to both anti-CD3/anti-CD28 and ConA stimulation (7, 9, 10). Our laboratory discovered that these M-MDSCs also strongly inhibited B cell proliferation (7) and B regulatory cell IL-10 responses (11); to our knowledge, this is the first report of MDSC-mediated suppression of B cells. Subsequently, additional evidence for B cells as targets of MDSCs has been presented (12–14), particularly in autoimmunity (15–18) and during B cell lymphopoiesis (19–21). There is increasing appreciation of the role MDSCs play in viral systems (22). In addition to the LP-BM5 retrovirus, the causative agent of murine AIDS (MAIDS), MDSCs have recently been implicated during infections by retroviruses such as human (23–29) and simian immunodeficiency viruses (23, 30–32), RNA viruses such as influenza A virus (33, 34) and lymphatic choriomeningitis virus (35), and DNA viruses such as hepatitis B virus (36–39), HSV (40, 41), and vaccinia virus (42). M-MDSCs that are expanded during LP-BM5 infection suppressed B cell proliferation in response to polyclonal activators, including LPS and anti-CD40 + IL-4 stimulation, and specifically suppressed proliferation of IL-10–producing regulatory B cells (7, 11). These polyclonal activators were chosen because of their classic use in defining the immunosuppression of B cells during LP-BM5 infection (43, 44) and their ability to stimulate a strong B cell response. Furthermore, there is precedent for viral signaling through TLR4, the receptor through which LPS signals, during related retroviral immune responses to mouse mammary tumor virus and Moloney murine leukemia virus (a relative of the ecotropic murine leukemia virus found in the LP-BM5 retroviral isolate) (45, 46) as well as during responses to human retroviruses such as HIV-1 (47). Although M-MDSC suppression of T cell responses was entirely inducible NO synthase (iNOS)–dependent, iNOS accounted for only about half of the suppression of B cells (7). M-MDSCs from LP-BM5–infected mice used contact-dependent mechanisms—such as V-domain Ig-containing suppressor of T cell activation (VISTA) and VISTA in combination with iNOS—for ∼45% of their suppression of B cell proliferation and soluble mechanisms—such as production of superoxide, NO, peroxynitrite, and TGF-β—for much or all of the other 55% of their suppression of B cell proliferation (7, 8, 11). The use of multiple mechanisms along with the plasticity of MDSCs as immature myeloid lineage cells may be responsible for the observation that when the two major mechanisms of suppression were knocked out in iNOS/VISTA double-knockout MDSCs, overall levels of suppression remained relatively unchanged (11). As B cells remain an understudied target of MDSC-mediated suppression, in this article we describe in detail the phenotypic and functional effects of MDSCs on B cells and B cell subsets as well as the phenotype and function of B cells during LP-BM5 infection, during which M-MDSCs are expanded. The use of multiple M-MDSC effector mechanisms and the existence of multiple B cell subsets that are potential differential targets may result in unexpected M-MDSC–dependent consequences, some of which may appear, counterintuitively, to be positive in nature. For this reason, some of these M-MDSC–mediated changes in B cells are referred to in this article as alterations, as opposed to strictly suppression. Seven-week-old C57/Bl/6 (B6) mice were purchased from Charles River (Wilmington, MA) and OT-II mice (B6.Cg-Tg(TcraTcrb)425Cbn/J) from The Jackson Laboratory (Bar Harbor, ME). All mice were housed in the Center for Comparative Medicine and Research at the Geisel School of Medicine at Dartmouth and were used at ∼8–10 wk of age. All animal experiments were done with the approval of the Institutional Animal Care and Use Committee of Dartmouth College in conjunction with the Dartmouth Center for Comparative Medicine and Research, an American Association of Laboratory Animal Care–approved animal facility. LP-BM5 virus was prepared in the laboratory as previously described (48, 49). Mice were infected i.p. with 5 × 104 ecotropic PFUs as determined by a standard retroviral XC plaque assay (50). For enrichment of M-MDSC populations, splenocytes from pooled 5 wk postinfection (wpi) LP-BM5–infected B6 mice were labeled with beads coupled to anti-Ly6G–biotin to deplete Ly6G-positive cells and subsequently with anti-biotin–coupled paramagnetic beads. The negative flow-through was collected from a MACS column (Miltenyi Biotec, Auburn, CA), labeled with anti-CD11b–coupled paramagnetic beads, and column purified, leading to the standard enriched M-MDSC preparation previously employed (7–11). These cells are Gr-1+ Ly6C+ CD11b+ and exhibited significantly enhanced suppressive function of both B and T cells. This enriched population contains only ∼1% CD4+ Foxp3+ cells (8) and <5% CD4+ T cells and <5% CD8+ cells (J.L. Rastad, unpublished observations). Responder cells (uninfected, wild-type B6 splenocytes) were plated at 5 × 105 cells per well in 96-well plates. 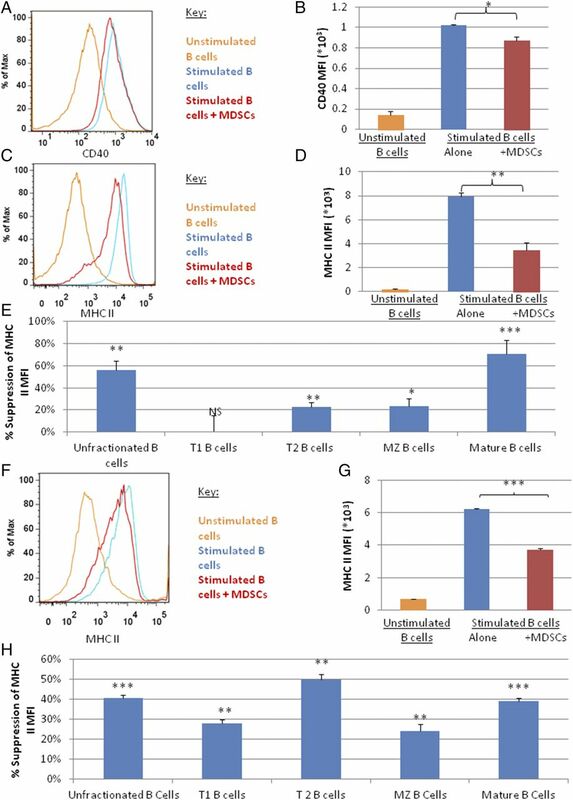 M-MDSCs (obtained from 5 wpi LP-BM5–infected mice and employed as Ly6G-depleted/CD11b-enriched splenocytes) were plated at a responder:M-MDSC cell ratio of 3:1 (mimicking the ratio of B cells to MDSCs in an infected spleen) in three to eight wells per condition in supplemented media (containing 5% FCS, l-glutamine, and antibiotics). Responder cells were stimulated with 40 μg/ml anti-CD40 + 10 ng/ml IL-4 or with 8.75 μg/ml LPS at 37°C and 5% CO2. Beginning at 66 h, wells were pulsed with 1 mCi [3H]thymidine (PerkinElmer, Waltham, MA). At 72 h, plates were harvested and assayed for thymidine incorporation using a scintillation counter. Percent suppression was calculated from the control response as previously described (7). Briefly, the percentage of residual responsiveness was calculated by determining the ratio of the cpm of responder cells with M-MDSCs over the cpm of the responders alone. The percentage of residual responsiveness was subtracted from 100% (control responsiveness) to determine the percent suppression. Additionally, responder cells or cells from naive versus 8 wpi LP-BM5–infected mice were stained with CFSE (Invitrogen, Carlsbad, CA) to assess proliferation in combination with surface markers to determine different cell populations (see below). For cell surface staining, 1–2 × 106 spleen cells (from M-MDSC suppression assays or directly ex vivo from naive or LP-BM5–infected mice) were incubated with a viability stain (7-AAD; eBioscience, San Diego, CA) and various Abs conjugated to FITC, PE, PerCP, allophycocyanin, Pe-Cy7, APC-Cy7, or Brilliant Violet 421. The cells were analyzed by a MACSQuant flow cytometer (Miltenyi Biotec) to detect expression of murine CD19 (6D5), CD21 (7E9), B220 (RA3-6B2), IgD (11-26c.2a), IgM (RMM-1), CD40 (3/23), MHC class II (MHC II; I-Ab, AF6-120.1), GL-7 (GL7), Fas (CD95, 15A7), and syndecan-1 (CD138, 3281-2) (BioLegend, San Diego, CA; BD Biosciences, San Jose, CA, eBioscience; Invitrogen, Carlsbad, CA). Positive gates were selected based on isotype and fluorescence minus one controls, and data were analyzed using FlowJo software (Tree Star). Supernates from stimulated B cell/M-MDSC suppression assays or from ex vivo spleen preparations containing B cells from naive and 8 wpi LP-BM5–infected mice were assessed for total Ig, IgM, IgG2c (previously denoted as IgG2a but renamed per Ref. 51), and IgG3 by an ELISA. Affinity-purified goat anti-mouse Ig, IgM, IgG2c, or IgG3 Abs were used to coat 96-well plates (Southern Biotechnology Associates, Birmingham, AL), and the ELISA was developed using an alkaline phosphatase–conjugated goat anti-mouse Ig (Southern Biotechnology Associates) and phosphate substrate (p4744; Sigma-Aldrich) and quantified at 405 nm using an ELISA reader. For B cell enrichment, splenocytes from naive or 8 wpi LP-BM5–infected B6 mice were labeled with anti-CD19–coupled paramagnetic beads. The bound cells were purified using a MACS column (Miltenyi Biotec). After stimulation with LPS and subsequent incubation with OVA, B cells were re-enriched. Purity, as assessed by flow cytometry, was >95%. B cells were purified from naive and 8 wpi mice (see the B cell enrichment process described above) and cultured with LPS in the presence or absence of M-MDSCs (see MDSC suppression assays, above) for 48 h. The B cells were then washed and re-enriched (again using the B cell enrichment process detailed above to remove cocultured MDSCs) and pulsed with 5 or 25 μg/ml OVA 323–339 peptide (amino acid sequence ISQAVHAAHAEINEAGR) (Sigma-Aldrich), the minimal I-Ab presented epitope for the B6 OT-II TCR (52), as indicated for 1.5 h on ice. B cells were washed gently to remove unbound OVA peptide and plated at 1 × 105 B cells per well with 5 × 105 OT-II splenocytes and cultured for 3 d. Beginning at 66 h, wells were pulsed with 1 mCi [3H]thymidine (PerkinElmer). At 72 h, plates were harvested and assayed for thymidine incorporation using a scintillation counter, and percent MDSC suppression was calculated. Extracellular acidification rate (ECAR) and oxygen consumption rate (OCR), measures of glycolytic capacity and mitochondrial respiration, were measured using the Seahorse Bioscience XF96 technology (Billerica, MA). Supernates were collected from polyclonally stimulated responder B cells alone or stimulated responder B cells cocultured with M-MDSCs as described above for the [3H]thymidine assays. Supernates were collected at 40 h and transferred to recipient responder B cells that had been stimulated in parallel, as detailed previously (11). At 66 h, these recipient B cells were washed with XF Assay Media, plated at 1 × 106 cells per well in a 96-well XF culture plate, and incubated for 20 min–1 h at 37°C in a non–carbon dioxide incubator. At various times recommended by the manufacturer, oligomycin (final well concentration of 1 μM), carbonyl cyanide 4-(trifluoromethoxy)-phenylhydraxone (FCCP, final concentration of 2 μM), and rotenone (final concentration of 0.5 μM) were released from injection ports and measurements were taken in real time to determine the effects of the M-MDSC-supernate on metabolism. Similarly, B cells from naive and 8 wk post-LP-BM5–infected mice were stimulated ex vivo with LPS and analyzed at 66 h.
Responder cells were stimulated with polyclonal activators in the presence or absence of M-MDSCs, as described above for the [3H]thymidine incorporation assays. At 66 h, cells were washed with PBS, resuspended in PBS alone (as a negative control) or PBS + 50 μM 2-(N-(7-nitrobenz-2-oxa-1,3-diazol-4-yl)-amino)-2-deoxyglucose (2-NBDG, a fluorescent glucose analog; Invitrogen), and incubated for 1 h at 37°C and 5% CO2. Cells were then collected and stained using surface Abs (specifically those used for B cell subsetting: CD19, IgM, IgD, and CD21) and 7-AAD and measured on the MACSQuant, as described above for flow cytometry assays. SD of the mean were determined and compared statistically using a Student t test, and the Holm–Bonferroni post hoc method was used to correct for multiple comparisons. All experimental data shown are representative from a set of at least three individual experiments with a similar pattern of results. M-MDSCs preferentially suppressed proliferation of transitional type 2 B cells. As previously reported, M-MDSCs from LP-BM5–infected mice suppressed B cell proliferation in response to polyclonal B cell activators, including LPS and anti-CD40 + IL-4, as measured by both [3H]thymidine incorporation and CFSE dilution (7, 8, 10, 11). As B cells in various stages of development respond differently to a variety of stimuli and suppressive factors (53, 54), the effects of M-MDSCs on proliferation of different B cell subsets was determined. B cells enter the spleen as transitional type 1 (T1) B cells (CD19+ IgMhi IgD− CD21−) (55). There they transition to transitional type 2 (T2) B cells (CD19+ IgMhi IgDmid/+), which can become mature follicular (CD19+ IgMlo IgDhi) or marginal zone (MZ) (CD19+ IgMhi IgD− CD21hi) B cells depending on the activating stimuli (55). Using a combination of CFSE dye dilution and cell surface staining, we determined that M-MDSCs from LP-BM5–infected mice consistently specifically suppressed the proliferation in response of the T2 B cell subset to LPS, with minimal effects on the other subsets, including the T1 (Fig. 1A–C), mature, and MZ subsets (data not shown). This suppression of the T2 B cell subset was statistically significant, as indicated by an increase in CFSE mean fluorescence intensity (MFI) (Fig. 1B) and an average of a 30% decrease in the percentage of cells that divided (Fig. 1C) in cultures containing M-MDSCs when compared with otherwise identical cultures lacking M-MDSCs. Minor differences in survivability make it difficult to reconstruct the magnitude of the effect on the B cell compartment by summing up the effects of individual subsets; however, the selectivity for the T2 compartment was striking. Importantly, M-MDSCs also substantially decreased B cell proliferation (by ∼80%) in response to anti-CD40 + IL-4. The most pronounced decreases were observed in the mature B cell subset, followed by the T2 subset (data not shown). M-MDSCs preferentially suppressed proliferation of T2 B cells. (A) CFSE in combination with surface staining and flow cytometry was used to visualize division of B cells in different developmental stages in response to LPS, either in the presence or absence of M-MDSCs. (B) Geometric MFIs of CFSE staining, (C) percentage of cells divided, (D) division indices, and (E) proliferation indices of CFSE staining. (F) Geometric MFIs of CFSE staining of divided cells in different developmental subsets. Data shown are from a representative experiment, with a similar pattern of results observed in three additional experiments. p values indicated comparisons with B cells alone. *p < 0.05, **p < 0.01, ***p < 0.001. To further probe the effects of M-MDSCs on B cell proliferation, the division and proliferation indices were calculated for both the B cell population as a whole and for the T2 B cell subset. The division index, which represents the average number of divisions by each cell (including cells that never divide), was significantly decreased in the presence of M-MDSCs for both the unfractionated B cell population (average decrease of ∼30%) and for the T2 population (average decrease of ∼40%) (Fig. 1D). In contrast, the proliferation index, which represents the average number of divisions by each dividing cell (and does not include cells that never divide), remained unchanged in all experiments (Fig. 1E). Collectively, these data indicated that M-MDSCs decrease the number of B cells entering division but that once these cells enter the cell cycle, they undergo an equivalent number of divisions to cells in the absence of M-MDSCs. Supporting this conclusion, the MFI of the divided cells remained unchanged in the presence of M-MDSCs (Fig. 1F), in sharp contrast to the significant M-MDSC inhibitory effects on the CFSE dilution by MFI assessment of all cells (including the parental peak) (see Fig. 1B). As Ab production is a main function of B lineage cells and is driven by CD40-signaling, we next determined the effects of M-MDSCs on Ig production using anti-CD40 + IL-4 stimulation. An Ig ELISA indicated that, surprisingly, in the presence of M-MDSCs, B cells increased Ig production (Fig. 2A). M-MDSCs increased production of both IgM and of the class-switched Abs, IgG2c and IgG3 (Fig. 2B–D). Based on these alterations, it is tempting to speculate that M-MDSC function alters Ab production by increasing class switching. In agreement with this hypothesis, M-MDSC coculture repeatedly increased the proportion (Fig. 2E) and number (Fig. 2F) of germinal center (GC) B cells (defined as CD19+ IgMloGL-7+ and later confirmed as CD19+ GL-7+ Fas+), the population that undergoes class-switch recombination. GC B cells can differentiate into memory B cells or Ab-secreting cells (56). To further probe the M-MDSC–dependent alterations seen in Ab production, the proportions of Ab-secreting cells were determined. In agreement with the increased Ig levels, M-MDSCs led to increased proportions (Fig. 2G) and numbers (Fig. 2H) of Ab-secreting cells (B220+ CD138+). Of note, because of decreased B cell survivability and low cell numbers in the absence of stimulation, the proportion of Ab-secreting cells among live unstimulated B cells is higher than that of stimulated B cells (Fig. 2G), yet the number of Ab-secreting cells is considerably lower (Fig. 2H). ELISA data measuring production of (A and I) total Ig, (B and J) IgM, (C and K) IgG2c, and (D and L) IgG3 by B cells stimulated with (A–D) αCD40 + IL-4 or (I–L) LPS in the presence or absence of M-MDSCs. Data shown in (A)–(D) are from a representative experiment, with a similar pattern of results observed in three experiments. Data shown in (I)–(L) are also from a representative experiment, with a similar pattern of results observed in five experiments. Representative flow plots showing (E) GC B cells and (G) Ab-secreting B cells stimulated with αCD40 + IL-4 in the presence or absence of M-MDSCs. (F and M) Quantification of GC B cell numbers and of (H and N) Ab-secreting cell numbers after stimulation with (F and H) αCD40 + IL-4 or (M and N) LPS. (O) Geometric MFIs of CFSE staining was used to visualize division of GC B cells in response to LPS in the presence or absence of M-MDSCs. Data shown in (E)–(H) and in (M)–(O) are from representative experiments, with a similar pattern of results observed in at least two experiments. *p < 0.05, **p < 0.01, ***p < 0.001. In terms of the ability to generalize to other forms of B cell stimulation, M-MDSCs had similar effects on IgG subclass production in response to LPS stimulation (Fig. 2K, 2L). Additionally, LPS stimulation in the presence of M-MDSCs also increased the proportion of GC B cells (Fig. 2M), indicating that these alterations were not specific to anti-CD40 + IL-4 stimulation. However, M-MDSCs did not affect total Ig (Fig. 2I) and actually decreased IgM production (Fig. 2J) in response to LPS stimulation, unlike anti-CD40 + IL-4 stimulation. In agreement with the lack of effect on total Ig levels, M-MDSCs did not increase or decrease Ab-secreting cells in response to LPS stimulation (Fig. 2N). M-MDSCs actually decreased proliferation of GC B cells in response to LPS (Fig. 2O) despite increasing GC numbers and proportions, indicating that increases in this subset were likely due to increased differentiation or increased survival of differentiated cells. M-MDSCs had no significant effect on proliferation of Ab-secreting cells (data not shown). In the absence of stimulation, Ig production was below the level of detection given the controls (M-MDSCs alone stimulated with LPS) and as such was unaffected by M-MDSCs. M-MDSCs decreased expression of CD40 and MHC II. As B cells may serve as functional APCs to activate CD4+ T cells (57), and CD4+ T cells are important in providing costimulation to B cells (58), the effects of M-MDSCs on expression of molecules responsible for B cell cross-talk with CD4+ T cells were determined. Both anti-CD40 + IL-4 and LPS stimulation led to increased expression of the signal 1– and/or signal 2–associated molecules, MHC II, and/or CD40, respectively, on B cells. Although the vast majority of the B cells remained positive for these markers, M-MDSCs reproducibly decreased CD40 density in LPS-stimulated B cells by an average of ∼15% (Fig. 3A, 3B). This decrease was roughly equivalent across all developmental subsets (data not shown). CD40 expression was not tested with anti-CD40 + IL-4 stimulation because of the potential for interference between the CD40-staining Ab and the activation Ab and because of activation-induced receptor internalization. CD86 expression by activated B cells, in contrast, was not altered by M-MDSCs, indicating that not all costimulatory molecules are downregulated by M-MDSCs (data not shown). (A) Representative flow plots showing CD40 expression of B cells stimulated with LPS in the presence or absence of M-MDSCs. (B) Geometric MFIs of CD40 on the B cell compartment. (C and F) Representative flow plots showing MHC II expression of B cells stimulated with (C) αCD40 + IL-4 or (F) LPS in the presence or absence of M-MDSCs. (D and G) Geometric MFIs of MHCII on the B cell compartment when stimulated with (D) αCD40 + IL-4 or (G) LPS. (E and H) Percent suppression of MHC II geometric MFI on different developmental subsets of (E) αCD40 + IL-4–stimulated or (H) LPS-stimulated B cells by M-MDSCs. Data shown in (A)–(H) are from a representative experiment, with a similar pattern of results observed in four experiments. Statistics in (E) and (H) represent comparisons of MFI of B cells within the indicated subset in the presence or absence of M-MDSCs. *p < 0.05, **p < 0.01,***p < 0.001. Similarly, M-MDSCs also consistently decreased the density of the signal 1 molecule MHC II—by ∼55% for anti-CD40 + IL-4 stimulation and by ∼40% for LPS stimulation (Fig. 3C, 3D, 3F, 3G). With anti-CD40 + IL-4 stimulation, the largest decrease was detected in the mature subset, followed by the MZ and T2 populations (Fig. 3E). For LPS stimulation, this decrease was significant for all subsets but most pronounced for the T2 B cell subset (Fig. 3H). Interestingly, this is the same subset whose proliferation was preferentially suppressed by these M-MDSCs (Fig. 1). M-MDSCs decreased B cell Ag presentation. To determine if the downregulation of MHC II by M-MDSCs seen in Fig. 3 was physiologically relevant, the ability of B cells activated in the presence or absence of M-MDSCs to present OVA peptide to OVA-specific, TCR-transgenic CD4+ OT-II T cells was determined. Briefly, highly enriched B cells (see Materials and Methods) were activated using LPS in the presence or absence of M-MDSCs. These B cells were then washed, re-enriched to remove M-MDSCs, and briefly pulsed with OVA peptide. 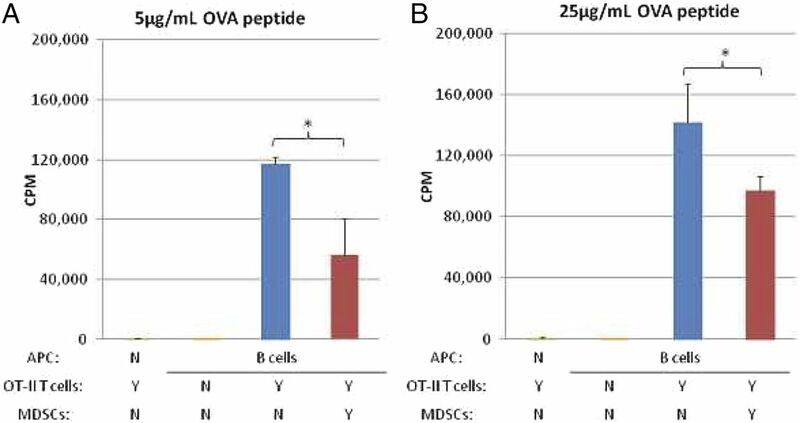 Unbound peptide was removed and equal numbers of B cells with bound peptide were cultured with OVA-specific transgenic OT-II CD4+ T cells (see Materials and Methods). In agreement with data on MHC II expression by flow cytometry (Fig. 3C–H), M-MDSCs decreased functional OVA antigen presentation by B cells at two different concentrations of OVA peptide by 30–50%, as quantified by [3H]thymidine incorporation by the OT-II T cells in the second readout coculture (Fig. 4). Importantly, this response was OVA specific and did not occur in the absence of peptide Ag or Ag-presenting B cells, and the possibility of detectable proliferation of (carryover) B cell APCs during the [3H]thymidine pulse was found to be negligible. These controls confirmed that the [3H]thymidine incorporation was due to OVA-specific activation of OT-II OVA-specific CD4+ T cells. These data indicated that M-MDSC–mediated downregulation of MHC II expression led to functionally decreased Ag presentation. 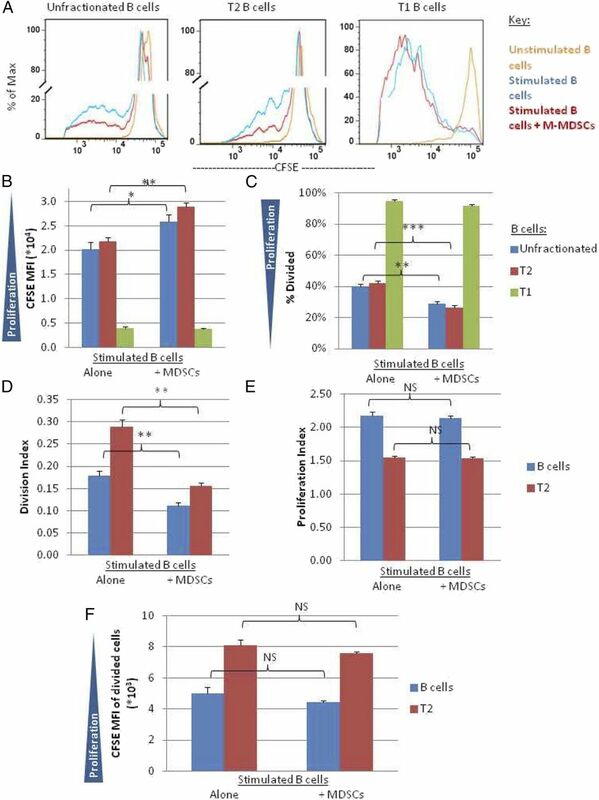 (A and B) [3H]Thymidine incorporation assays were used to assess M-MDSC suppression of Ag presentation by B cells pulsed with OVA peptide [(A) 5 μg/ml or (B) 25 μg/ml)]. Data shown are from a representative experiment, with a similar pattern of results observed in two experiments. *p < 0.05. M-MDSCs and their supernates decreased B cell metabolism. Many of the above-mentioned B cell functions, including proliferation, Ig production, and MHC II Ag presentation to trigger specific CD4+ T cell stimulation, require substantial amounts of cellular energy, sometimes over extended time periods. T cells respond to stimulation by rapidly increasing aerobic glycolysis in a process known as the Warburg effect (59, 60). In contrast, it has more recently been reported that B cells upregulate both oxidative phosphorylation and aerobic glycolysis upon activation (61, 62), but we are unaware of any reports on the possible alteration of B cell metabolism by MDSC function. In this study, LP-BM5–expanded M-MDSCs were able to decrease B cell proliferation (Fig. 1), alter Ab production and proportions of B cell developmental subsets (Fig. 2), decrease expression of the B cell surface molecules MHC II and CD40 (Fig. 3), decrease Ag presentation (Fig. 4), and, as previously reported by our laboratory, decrease IL-10 production by B regulatory cells (11). The effects of M-MDSCs on metabolism of the responding B cells were therefore assessed. Supernates from suppressive cocultures of M-MDSCs with stimulated B cells were used in place of M-MDSCs, as 1) the metabolism of the M-MDSCs could affect the metabolic readouts of the culture and 2) supernates from such M-MDSC cocultures (but not control supernates) are able to suppress B cells, with soluble mediators (including NO, peroxynitrite, superoxide, and TGF-β) accounting for the majority of M-MDSC–mediated suppression of B cells (11). The effect of these supernates from M-MDSC cocultures on B cell metabolism were compared with control supernates from responder cells stimulated alone. Importantly, no differences were identified in viability of the B cells in the presence of M-MDSC–derived supernates from suppression cocultures versus supernates from control cultures lacking M-MDSCs, and equal numbers of B cells from each condition were tested, eliminating any differences due to any possible minor levels of cell death and/or variation in cell numbers. 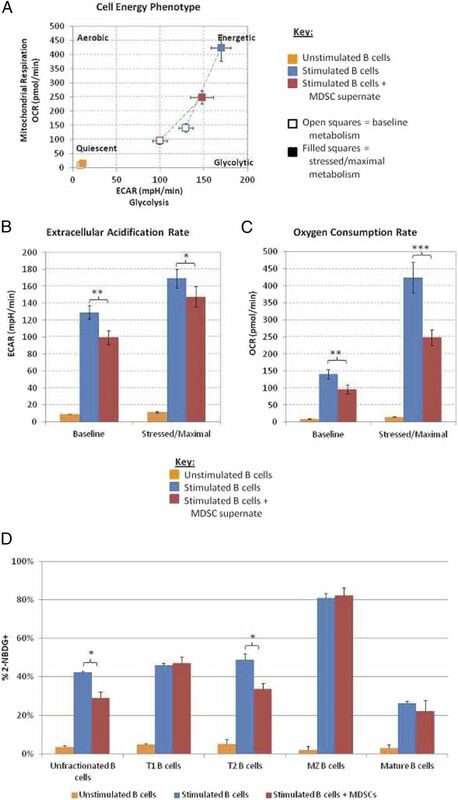 Supernates generated from suppressive M-MDSC cocultures (with B cells stimulated by LPS) significantly reduced both the baseline ECAR and the OCR of the B cells in all experiments, whereas supernates from stimulated B cells cultured alone had no effect. 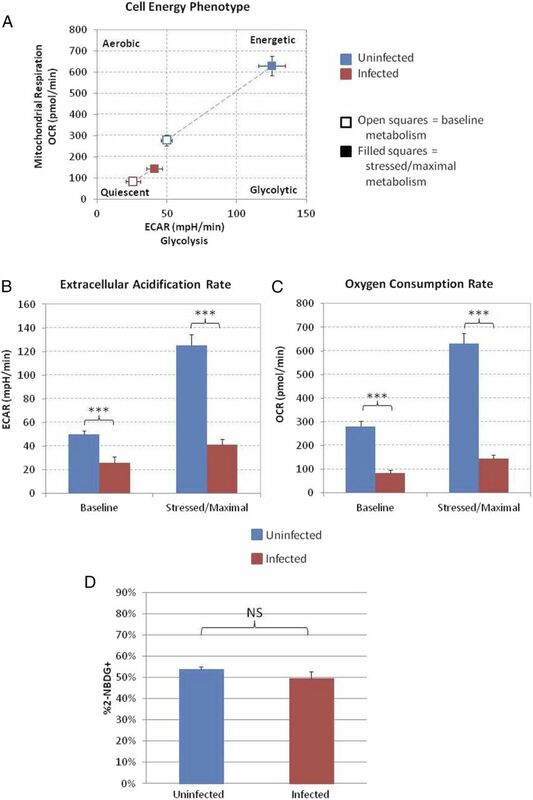 Together, these results indicate that M-MDSC function causes reductions in the rates of aerobic glycolysis and oxidative phosphorylation at baseline or starting culture conditions, respectively (Fig. 5A–C). (A) Cell energy phenotype of B cells stimulated with LPS in the presence of supernates derived from suppressive cultures of MDSCs and B cells. (B) Quantification of ECAR and (C) OCR. (D) 2-NBDG (fluorescent glucose analog) uptake by B cells stimulated with LPS in the presence or absence of M-MDSCs. Data shown in (A)–(D) are from a representative experiment, with a similar pattern of results observed in three experiments. *p < 0.05, **p < 0.01, ***p < 0.001. When oligomycin, which inhibits ATP production by mitochondria, thereby forcing the cell to use glycolysis, was injected, ECAR values were significantly reduced in the presence of M-MDSCs (Fig. 5B), indicating that even under stressed conditions in which glycolysis was pushed to its maximal level, M-MDSC supernates were able to inhibit glycolysis. Similarly, when FCCP was used to depolarize the mitochondrial membrane and allow for maximal electron flux through the electron transport chain, thereby increasing OCR rates, M-MDSC supernates were still able to substantially inhibit oxidative phosphorylation (Fig. 5C). These results imply that suppressive M-MDSC supernates (from their coculture with LPS-stimulated B cells) decrease the maximal rates of aerobic glycolysis and respiration that the responding B cells can achieve. The effects of M-MDSCs on metabolism appear to be dependent on the type of stimuli, as the presence of supernates from analogous M-MDSC/B cell cocultures in which the B cell activator was instead anti-CD40 + IL-4 did not dramatically affect the metabolism of these B cells. However, it is possible that the timing and other conditions used were not optimal to detect small metabolic effects for simulations other than LPS. As both oxidative phosphorylation and glycolysis require glucose consumption, we next measured glucose uptake using the fluorescent glucose analog 2-NBDG in the presence or absence of M-MDSCs as an initial approach to characterize the molecular mechanism(s) underlying these decreases in metabolic activity. M-MDSCs reduced glucose uptake by the unfractionated B cell compartment by ∼30% (Fig. 5D). This decrease was primarily associated with the statistically significant decrease observed in the T2 subset, the same developmental subset found to be targeted for M-MDSC suppression of both proliferation (Fig. 1) and MHC II density (Fig. 3). In contrast, and consistent with the data of Fig. 1 (see Results text) T1 and MZ B cells again demonstrated relative resistance to the effects of M-MDSC inhibition of glucose uptake. Overall, the data in Figs. 1–5 indicate that M-MDSCs alter the B cell compartment in subset-specific ways, reducing proliferation, Ag presentation, and metabolism while increasing both total Ig production and especially production of class-switched IgG subclasses. LP-BM5 retroviral infection preferentially decreased proliferation of T2 B cells. To determine if similar phenotypic and functional changes also occur during LP-BM5 retroviral infection, B cells from naive or infected mice were analyzed directly ex vivo. As was observed with M-MDSC–treated B cells in in vitro suppression assays, in vivo LP-BM5 infection resulted in a decreased ability of B cells to proliferate when stimulated ex vivo (Fig. 6A–C). This decrease in proliferative ability to respond was especially pronounced among the T2 B cell subset, whereas for T1 B cells (Fig. 6A–C) and the other subsets (data not shown), infection resulted in a <10% change in the percentage of B cells that divided (which reached significance in some, but not all, experiments). Neither B cells from naive nor infected mice proliferated significantly in the absence of stimulation, as assessed by both [3H]thymidine incorporation and CFSE dilution (data not shown). Spleens from LP-BM5 retrovirus–infected mice exhibited a significant decrease in the proportion of B cells that were in the T2 stage of development (Fig. 6D), corroborating the selective effect of M-MDSCs on proliferation of this subset (Fig. 1). (A) CFSE in combination with surface staining for flow cytometry was used to visualize division of B cells in different developmental stages from naive and LP-BM5–infected mice in response to LPS stimulation in vitro. (B) Geometric MFIs of CFSE and (C) percentage of cells divided of different developmental subsets. (D) Proportions of T2 B cells in spleens of infected and uninfected mice. Data shown in (A)–(D) are from a representative experiment, with a similar pattern of results observed in three experiments. *p < 0.05, **p < 0.01, ***p < 0.001. LP-BM5 retroviral infection increased Ab production. LP-BM5 infection leads to increased Ig levels in the serum, a classic aspect of retrovirus and MAIDS pathogenesis (7, 63). 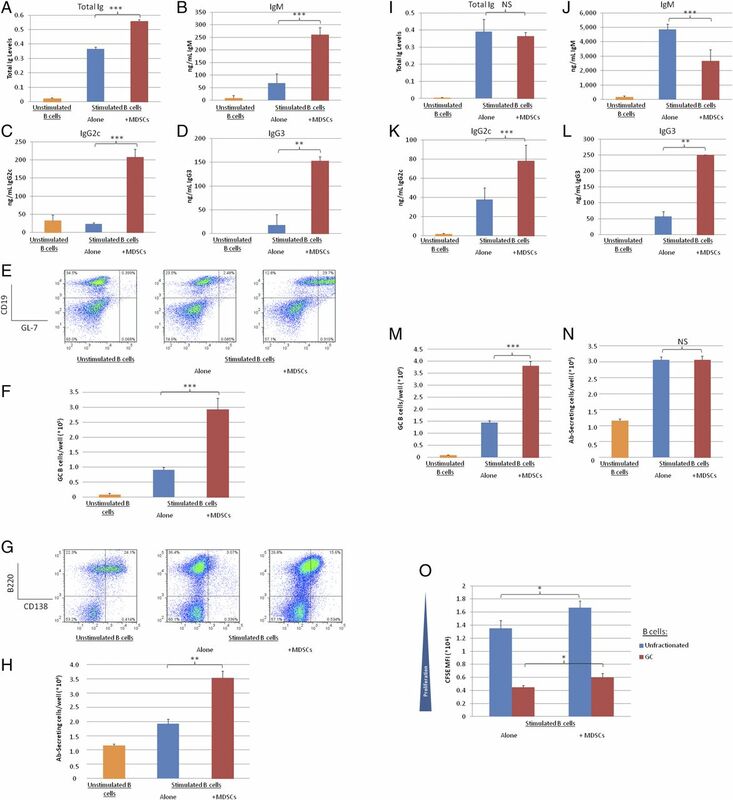 An Ig ELISA performed on supernates from naive and infected spleens immediately ex vivo revealed that in agreement with our in vitro M-MDSC suppression assay data for anti-CD40 + IL-4 (Fig. 2A, 2B), total Ig levels (Fig. 7A) and IgM levels (Fig. 7B) increased in the spleen. Additionally, similar to what was observed with in vitro M-MDSC suppression assay data for anti-CD40 + IL-4 and LPS (Fig. 2C, 2D, 2K, 2L), IgG2c and IgG3 levels increased significantly in the spleens of infected animals (Fig. 7C, 7D). 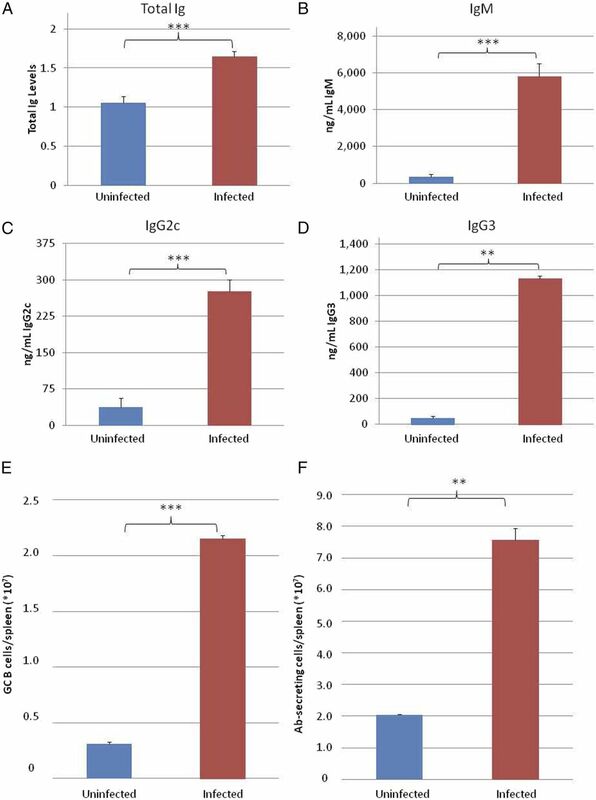 ELISA data measuring levels of (A) total Ig, (B) IgM, (C) IgG2c, and (D) IgG3 in spleens from naive and LP-BM5–infected mice directly ex vivo. Numbers of (E) GC B cells and (F) Ab-secreting cells. Data shown in (A)–(F) are from a representative experiment, with a similar pattern of results observed in three experiments. **p < 0.01, ***p < 0.001. Because suppression assays with isolated, retrovirally expanded M-MDSCs revealed that the increase in class-switched and total Ig production correlated with an increase in the proportion of GC B cells (Fig. 2F, 2M) and Ab-secreting cells (Fig. 2H), the number of such B cells in the spleen was determined in naive and infected animals immediately ex vivo. Similar to what was demonstrated with M-MDSC suppression in vitro, LP-BM5 infection lead to a steady increase in the proportion and number of GC B cells (Fig. 7E) and Ab-secreting cells (Fig. 7F) in all experiments. LP-BM5 retroviral infection decreased expression of CD40. The expression by B cells of the surface molecules CD40 and MHC II, both of which were inhibited by M-MDSCs in in vitro suppression assays (Fig. 3), was also determined on B cells from naive and infected mice directly ex vivo. CD40 expression was repeatedly decreased in response to LP-BM5 infection (Fig. 8A), potentially reflecting the demonstrated effects of M-MDSCs on the B cell compartment. However, in the case of infection, decreases in CD40 expression were specific to the mature B cell compartment, whereas in in vitro M-MDSC suppression assays, these changes occurred globally in B cells without obvious subset specificity. In contrast, the density of MHC II was marginally, but consistently, increased when compared with naive mice (Fig. 8B). This increase was consistent across all developmental subsets (data not shown). (A and B) Geometric MFIs (A) CD40 and (B) MHC II on different developmental subsets of B cells from naive and LP-BM5–infected mice directly ex vivo. Data shown are from a representative experiments, with a similar pattern of results observed in three to four experiments. ***p < 0.001. M-MDSCs decreased Ag presentation by B cells from LP-BM5–infected mice. In that M-MDSCs were able to suppress Ag presentation by uninfected B cells (Fig. 4), we tested whether these M-MDSCs could also suppress Ag presentation by infected B cells, which had slightly higher baseline MHC II expression. Importantly, M-MDSCs were able to strongly decrease functional Ag presentation by B cells from infected mice stimulated ex vivo on a per-cell basis, as measured by proliferation of OT-II CD4+ T cells (see Materials and Methods), indicating that M-MDSCs are able to suppress APC function even in the context of retrovirally activated B cells (Fig. 9A). B cell APCs carried over during the [3H]thymidine pulse did not proliferate, and proliferation of OT-II CD4+ T cells required both APCs and OVA peptide. As a biological control, these M-MDSCs were also able to suppress proliferation of stimulated B cells from infected mice (Fig. 9B). (A) [3H]Thymidine incorporation assays were used to assess M-MDSC suppression of Ag presentation by OVA peptide–pulsed B cells from LP-BM5 retrovirus–infected mice (25 μg/ml OVA peptide) (see Materials and Methods). (B) Parallel [3H]thymidine incorporation assays showing M-MDSC suppression of proliferation of B cells from LP-BM5 retrovirus–infected mice. Data shown in are from a representative experiment, with a similar pattern of results observed in two experiments. **p < 0.01, ***p < 0.001. LP-BM5 retroviral infection decreased B cell metabolism. Because M-MDSCs were able to suppress the upregulation of B cell metabolism following activation by LPS in ex vivo M-MDSC suppression assays (Fig. 5), the metabolic pathway use of B cells from naive and infected mice was tested following LPS activation. When compared with stimulated B cells from uninfected control mice, the metabolism of stimulated B cells from infected mice was highly significantly and broadly reduced (Fig. 10A). This decrease was detected in both baseline and stressed ECAR and OCR (Fig. 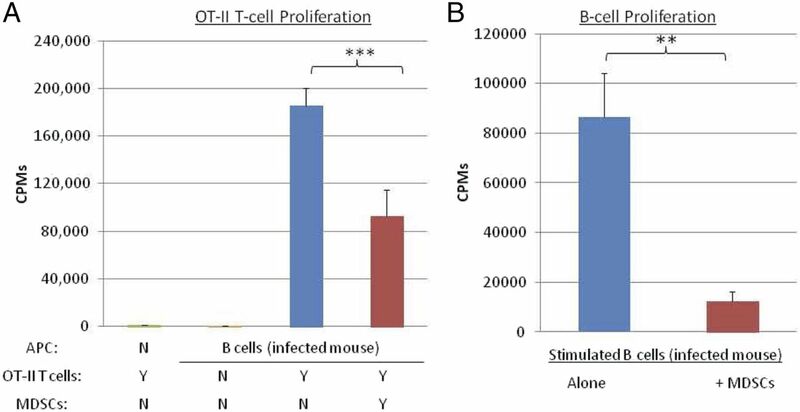 10B, 10C), indicating that in infection, B cells displayed reduced ability to upregulate metabolism in response to stimulation, similar to what was displayed with B cells cocultured with M-MDSCs. Of note, unstimulated B cells from naive and infected mice had very low metabolic pathway use after culture. However, the low levels of both OCR and ECAR after culture were slightly increased in unstimulated B cells from infected mice (data not shown). When B cell metabolism was measured directly ex vivo (without culture), B cells from infected mice exhibited increased metabolism, likely due to immune activation as a consequence of infection (data not shown). (A) Cell energy phenotype of B cells from naive or LP-BM5–infected mice stimulated with LPS. (B) Quantification of ECAR and (C) OCR. (D) 2-NBDG (fluorescent glucose analog) uptake by B cells from naive or LP-BM5–infected mice stimulated with LPS. Data shown in (A)–(D) are from a representative experiment, with a similar pattern of results observed in three experiments. ***p < 0.001. Interestingly, glucose uptake was unaltered in B cells from infected mice when compared with B cells from naive mice in all experiments (Fig. 10D) despite the observation that glycolysis and oxidative phosphorylation decreased in response to infection. These data indicate that the effects of infection on glycolysis and oxidative phosphorylation are not due to decreased glucose uptake. M-MDSCs are expanded during LP-BM5 retroviral infection and are capable of suppressing B cell responses through a combination of mechanisms, including production of soluble mediators, such as reactive oxygen species, reactive nitrogen species, and the cytokine TGF- β, as well as cell contact–mediated mechanisms, including VISTA-dependent mechanisms (7, 8, 11). In that B cells are a novel target of M-MDSC suppression, the effects of retrovirally expanded M-MDSCs on B cell phenotype and function were determined and compared with the effects of in vivo retroviral infection. In this study we demonstrate that M-MDSCs specifically decreased the proliferative response of the T2 developmental subset of B cells, which is associated with decreased entry into the cell cycle as opposed to decreases in the number of divisions of cycling cells (Fig. 1). 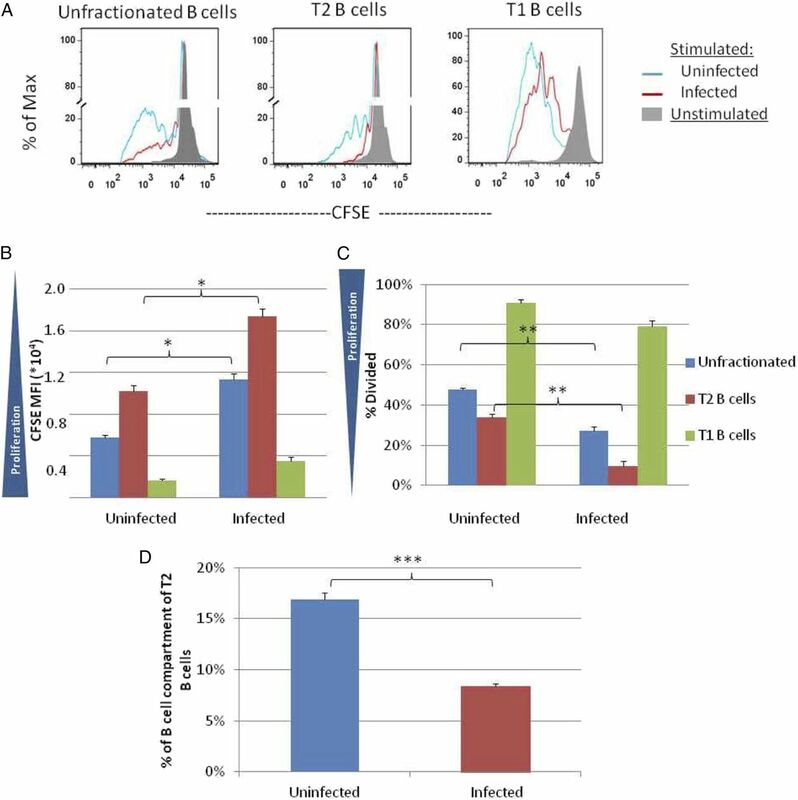 In agreement with these observations from in vitro M-MDSC–mediated suppression of wild-type uninfected B cells, B cells from LP-BM5 retrovirus–infected mice exhibited similarly decreased proliferation in response to polyclonal stimulation, particularly among the T2 B cell subset (Fig. 6). Furthermore, the T2 subset was diminished in infected mice when compared with uninfected controls. Interestingly, we previously reported that M-MDSCs suppressed proliferation of IL-10–producing regulatory B cells (11), which are contained within the T2 B cell lineage (64, 65). The selective specificity of M-MDSC suppression of proliferation for B cells at this developmental stage will require further study but may be due to differences in signaling requirements for proliferation and survival (53, 54). Since our laboratory’s initial finding that LP-BM5-expanded M-MDSCs suppress B cell proliferation (7), MDSCs have also been found to suppress B cell activation and proliferation in other systems, including murine models of autoimmunity (15, 16). As detailed earlier in this article, MDSC expansion has been detected in humans, particularly during HIV infection, and has been observed to result in the suppression of proliferation of T cells (23–29). During the time of the writing of this paper, Lelis et al. (13) published a report on the effects of human MDSCs on B cells, albeit about granulocyte-like MDSCs, not M-MDSCs, and in the context of healthy donors, not retrovirus-induced immunodeficiency. The authors observed that human G-MDSCs suppressed in vitro B cell proliferation in a manner that involved the mediators arginase-1, NO, and reactive oxygen species (13). M-MDSCs also altered Ab responses of target B cells by increasing production of class-switched IgG Abs (Fig. 2). This increased IgG production was accompanied by an increase in proportions and numbers of GC B cells, the developmental subset that undergoes class switching. In the context of anti-CD40 + IL-4 stimulation, M-MDSCs also increased total Ab production, IgM production, and proportions and numbers of Ab-secreting cells (Fig. 2). Similar to the observed effects of M-MDSCs on B cells in vitro, LP-BM5 infection also resulted in increased Ab levels in the spleen and increased numbers of GC B cells and Ab-secreting cells (Fig. 7). These data are in agreement with a recent report from Xu et al. (12) in a murine fibrosarcoma model, in which it was reported that MDSCs accumulated around the GCs of tumor-bearing mice and increased IgA, IgG2c, and IgG1 production, suggesting that MDSCs may play an important, broad role in a variety of disease states to promote class switching and terminal differentiation of B cells. Interestingly, the increase in IgA in this tumor model was found to be mediated in part by TGF-β (12), one of the soluble mediators of B cell suppression we identified in the LP-BM5 system (11). TGF-β has also been observed to inhibit proliferation and increase class switching to IgG2c and IgG3 (66), consistent with the increase in these specific IgG subclasses both in the presence of M-MDSCs and in LP-BM5 retrovirus–infected mice (Figs. 2, 7). GC B cells are part of the mature subsets of B cells and develop from T2 B cells. Of the several hypotheses that could explain the observed increase in GC B cells, one possibility is that instead of proliferating, T2 B cells or mature B cells stimulated in the presence of M-MDSCs or LP-BM5 infection could be steered to differentiate into GC B cells. In agreement with this hypothesis, several studies indicate that 1) differentiation to GC B cells and Ab-secreting cells does not require proliferation (66, 67) and 2) proliferation and differentiation may be opposing processes that are balanced in part by caspases—for example, caspase-6 (68, 69). In this study, despite increasing the numbers and proportions, M-MDSCs actually decreased proliferation of the GC B cells (Fig. 2O) and had little to no effect on proliferation of Ab-secreting cells. LP-BM5–expanded M-MDSCs also altered B cell phenotype and function by decreasing expression of the B cell surface molecules CD40 and MHC II (Fig. 3) and, in concert, decreasing Ag presentation (Fig. 4). CD40 expression was also reduced in response to infection (Fig. 8). In contrast, LP-BM5 infection led to slight but non–statistically significant increases in MHC II levels, perhaps because of retrovirus-induced activation. Importantly, in ex vivo suppression assays, M-MDSCs inhibited Ag presentation by these ex vivo stimulated infected B cells (Fig. 9). Signaling through CD40 is important in GC formation and in activating class switching and somatic hypermutation in B cells (70–72). The observed decrease in CD40 may seem paradoxical at first given that M-MDSCs also increased B cell production of class-switched Abs. However, this may be explained, at least in part, by the observation that in other systems, CD40 is internalized after ligation (73, 74). We have previously published that CD40–CD154 binding between B and CD4+ T cells, respectively, and CD40 signaling through selective TRAF adaptor proteins is required for initiation and progression of LP-BM5–induced pathogenesis (49, 75–77). Based on this involvement of CD40 signaling in pathogenesis, it is tempting to speculate that M-MDSC–mediated decreases in CD40 expression, which are reflected in B cells from LP-BM5–infected mice, could help to moderate disease, even in highly susceptible B6 mice. These alterations in B cell phenotype and function coincided with decreased glycolysis and oxidative phosphorylation and decreased glucose uptake in the presence of MDSC, which was most prominent in the T2 B cell subset (Fig. 5). Correspondingly, B cells from infected mice demonstrated severe metabolic defects, analogous to some of those observed in in vitro MDSC–B cell suppression assays, with decreases in both baseline and stressed and/or maximal aerobic glycolysis and oxidative phosphorylation (Fig. 10). Interestingly, whereas M-MDSCs decreased glucose uptake by B cells in ex vivo suppression assays, infection did not significantly affect glucose uptake (Fig. 10). Several potential explanations exist for the decreases in glycolysis and oxidative phosphorylation yet sustained glucose uptake seen in B cells from infected mice. For example, decreases in glucose transport may not be necessary for decreases in glycolysis and oxidative phosphorylation, as glucose uptake may not be the rate-limiting step. Alternatively, glucose could be used for other metabolic pathways to generate sufficient energy required by the B cells, such as the pentose phosphate pathway (which is involved in nucleic acid synthesis and antioxidant generation; see Ref. 78) or lipid synthesis. It has been reported that whereas B cell proliferation entails activation of aerobic glycolysis, Ig production is characterized by reduced glycolysis and increased consumption of glutamine (79). In addition, increased lipid synthesis likely cooperates to provide for the increases in the endoplasmic reticulum and other endomembrane networks (i.e., the Golgi apparatus) necessary for Ig synthesis (80). Ab-secreting cells also increase autophagy to meet their metabolic demands and to regulate endoplasmic reticulum size and stress (81). Future studies would be needed to determine if M-MDSCs increase glutamine consumption, lipid synthesis, the pentose phosphate pathway, and/or autophagy in B cells concurrent with the increase in Ig production. Depletion of M-MDSCs remains an elusive target, both in the MDSCs field in general and in this nonacute retroviral infection system, due in part to both practical concerns arising from the relatively chronic time course of retroviral pathogenesis (e.g., dramatic immunodeficiency at 8 wpi) and the lack of MDSC-specific cell surface molecules to target (without targeting other important cell types) as well as the similarity in phenotype to other immune cells potentially involved directly in either viral pathogenesis or the host response (22). Thus, in an initial attempt to assess the potential of B cells as important targets of M-MDSCs and LP-BM5 disease, we showed in this study that the phenotype and function of B cells from infected mice is strongly correlated with observed in vitro effects of M-MDSCs on B cell targets. Despite these consistent and striking parallels, future studies are needed to provide direct evidence for M-MDSC function in vivo. Of special importance, reaching beyond this experimental system are the observations that M-MDSCs alter positively, rather than always inhibit, certain B cell subset proportions and/or functions, including GC B cell and Ab-secreting cell percentages and Ab production (Fig. 2). This is not unlike what is seen with other cell subsets traditionally defined as suppressive, such as T regulatory cells, which have been observed to promote Th17 responses (82, 83), tissue repair (84), and GC reactions (85) under certain conditions. A demonstration in the LP-BM5 system that M-MDSCs directly cause the positive effects observed in vivo would open up a new level of consideration for the capacities for MDSCs to differentially regulate specific cellular targets and their functions in various disease states. Similar to patients with HIV-induced AIDS, mice with LP-BM5–induced MAIDS display increased susceptibility to opportunistic infections, ranging from bacterial (86–88) to viral (89–94), fungal (95–98), and protozoan parasitic infections (99–102). Although data are limited regarding the role of B cell dysfunction in the increased susceptibility observed in LP-BM5–infected mice, humoral responses have been demonstrated to be important for clearance of many of these pathogens in other systems. The disease course of these opportunistic infections in LP-BM5–infected mice is similar to the disease course of these pathogens in B cell–deficient, non–LP-BM5–infected mice, indicating that B cell alterations could be a major contributing factor to increased susceptibility (103–105). Further understanding of the in vitro and ex vivo effects of MDSCs on B cell phenotype and function may help to address this increased susceptibility and provide approaches to prevent or treat opportunistic infections. We thank David Leib, Mary Jo Turk, Kathy Green, Megan O’Connor, Petra Sergent, Fiona McEnany, Yanbo Sun, Joshua Obar, Yina Huang, and Edward Usherwood for technical assistance and helpful discussions. This work was supported by Public Health Service Grant CA-50157 from the National Institutes of Health (NIH) and Pilot Grant P30 GM-10345 (both to W.R.G.) as well as stipend support for J.L.R. from NIH Institutional Training Grant T32 AI007363 (to Dr. C. Sentman). Flow cytometry was performed at DartLab, the Immune Monitoring and Flow Cytometry Shared Resource at the Geisel School of Medicine at Dartmouth, which is supported in part by Core Grant CA23108 from the National Cancer Institute to the Norris Cotton Cancer Center as well as Grants P20 (RR16437) and P30 (GM103415) from the National Institute of General Medical Sciences, as the Center of Biomedical Research Excellence in Molecular, Cellular, and Translational Immunological Research (to W.R.G., principal investigator).
. 2010. Myeloid-derived suppressor cells in human cancer. Cancer J. 16: 348–353.
. 2013. History of myeloid-derived suppressor cells. Nat. Rev. Cancer 13: 739–752.
. 2016. Recommendations for myeloid-derived suppressor cell nomenclature and characterization standards. Nat. Commun. 7: 12150.
. 2014. Myeloid-derived suppressor cell heterogeneity in human cancers. Ann. N. Y. Acad. Sci. 1319: 47–65.
. 2013. Myeloid-derived suppressor cells in murine retrovirus-induced AIDS inhibit T- and B-cell responses in vitro that are used to define the immunodeficiency. J. Virol. 87: 2058–2071.
. 2015. Selective involvement of the checkpoint regulator VISTA in suppression of B-cell, but not T-cell, responsiveness by monocytic myeloid-derived suppressor cells from mice infected with an immunodeficiency-causing retrovirus. J. Virol. 89: 9693–9698.
. 2016. Reciprocal relationship of T regulatory cells and monocytic myeloid-derived suppressor cells in LP-BM5 murine retrovirus-induced immunodeficiency. J. Gen. Virol. 97: 509–522.
. 2015. Subpopulations of M-MDSCs from mice infected by an immunodeficiency-causing retrovirus and their differential suppression of T- vs B-cell responses. Virology 485: 263–273.
. 2016. Myeloid-derived suppressor cells in murine AIDS inhibit B-cell responses in part via soluble mediators including reactive oxygen and nitrogen species, and TGF-β. Virology 499: 9–22.
. 2017. Myeloid-derived suppressor cells promote B-cell production of IgA in a TNFR2-dependent manner. Cell. Mol. Immunol. 14: 597–606.
. 2017. Myeloid-derived suppressor cells modulate B-cell responses. Immunol. Lett. 188: 108–115.
. 2013. Increased myeloid-derived suppressor cells in gastric cancer correlate with cancer stage and plasma S100A8/A9 proinflammatory proteins. J Immunol. 190: 794–804.
. 2015. Myeloid-derived suppressor cells regulate T cell and B cell responses during autoimmune disease. J. Leukoc. Biol. 97: 573–582.
. 2014. Impact of myeloid-derived suppressor cells on adoptive immunity in autoimmune arthritis. J. Immunol. 192: 200.6.
. 2016. Myeloid-derived suppressor cells induce the expansion of regulatory B cells and ameliorate autoimmunity in the sanroque mouse model of systemic lupus erythematosus. Arthritis Rheumatol. 68: 2717–2727.
. 2014. Myeloid-derived suppressor cells as a potential therapy for experimental autoimmune myasthenia gravis. J. Immunol. 193: 2127–2134.
. 2015. Inhibition of B lymphopoiesis by adipocytes and IL-1–producing myeloid-derived suppressor cells. J. Immunol. 195: 2666–2674.
. 2017. Inflammatory changes in bone marrow microenvironment associated with declining B lymphopoiesis. J. Immunol. 198: 3471–3479.
. 2016. Bone marrow fat and the decline of B lymphopoiesis in rabbits. Dev. Comp. Immunol. 58: 30–39.
. 2017. The role of myeloid-derived suppressor cells in viral infection. Viral Immunol. 30: 82–97.
. 2012. Expansion of a subset of CD14highCD16negCCR2low/neg monocytes functionally similar to myeloid-derived suppressor cells during SIV and HIV infection. J. Leukoc. Biol. 91: 803–816.
. 2013. Expansion of monocytic myeloid-derived suppressor cells dampens T cell function in HIV-1-seropositive individuals. J. Virol. 87: 1477–1490.
. 2012. Chronic progressive HIV-1 infection is associated with elevated levels of myeloid-derived suppressor cells. AIDS 26: F31–F37.
. 2014. HIV type 1 gp120-induced expansion of myeloid derived suppressor cells is dependent on interleukin 6 and suppresses immunity. J. Infect. Dis. 209: 441–451.
. 2016. Clinical significance of myeloid-derived suppressor cells in human immunodeficiency virus-1/ hepatitis C virus-coinfected patients. Scand. J. Immunol. 83: 438–444.
. 2015. In HIV-positive patients, myeloid-derived suppressor cells induce T-cell anergy by suppressing CD3ζ expression through ELF-1 inhibition. AIDS 29: 2397–2407.
. 2017. Myeloid-derived suppressor cells associated with disease progression in primary HIV infection: PD-L1 blockade attenuates inhibition. J. Acquir. Immune Defic. Syndr. 76: 200–208.
. 2014. Vaccine-induced myeloid cell population dampens protective immunity to SIV. J. Clin. Invest. 124: 2538–2549.
. 2017. Kinetics of myeloid-derived suppressor cell frequency and function during simian immunodeficiency virus infection, combination antiretroviral therapy, and treatment interruption. J. Immunol. 198: 757–766.
. 2017. Paradoxical myeloid-derived suppressor cell reduction in the bone marrow of SIV chronically infected macaques. PLoS Pathog. 13: e1006395.
. 2008. Invariant NKT cells reduce the immunosuppressive activity of influenza A virus-induced myeloid-derived suppressor cells in mice and humans. J. Clin. Invest. 118: 4036–4048.
. 2011. Increased MDSC accumulation and Th2 biased response to influenza A virus infection in the absence of TLR7 in mice. PLoS One 6: e25242.
. 2013. Chronic but not acute virus infection induces sustained expansion of myeloid suppressor cell numbers that inhibit viral-specific T cell immunity. Immunity 38: 309–321.
. 2015. Metabolic regulation of hepatitis B immunopathology by myeloid-derived suppressor cells. Nat. Med. 21: 591–600.
. 2014. Myeloid-derived suppressor cells regulate immune response in patients with chronic hepatitis B virus infection through PD-1-induced IL-10. J. Immunol. 193: 5461–5469.
. 2011. Immunosuppressive functions of hepatic myeloid-derived suppressor cells of normal mice and in a murine model of chronic hepatitis B virus. Clin. Exp. Immunol. 166: 134–142.
. 2015. The frequency of peripheral blood CD14(+)HLA-DR(-/low) MDSCs is negatively correlated with the inflammation in patients with chronic hepatitis B. Chin J. Cell Mol. Immunol. 31: 1387–1390, 1395.
. 2008. Activated inflammatory infiltrate in HSV-1-infected corneas without herpes stromal keratitis. Invest. Ophthalmol. Vis. Sci. 49: 1488–1495.
. 2012. On the role of regulatory T cells during viral-induced inflammatory lesions. J. Immunol. 189: 5924–5933.
. 2012. NK cell response to vaccinia virus is regulated by myeloid-derived suppressor cells. J. Immunol. 189: 1843–1849.
. 1990. B cells are required for induction of T cell abnormalities in a murine retrovirus-induced immunodeficiency syndrome. J. Exp. Med. 171: 315–320.
. 1989. Severe immunodeficiency disease induced by a defective murine leukaemia virus. Nature 338: 505–508.
. 2002. Murine retroviruses activate B cells via interaction with toll-like receptor 4. Proc. Natl. Acad. Sci. USA 99: 2281–2286.
. 2004. Toll-like receptor 4-dependent activation of dendritic cells by a retrovirus. J. Virol. 78: 576–584.
. 2016. HIV-1 gp120 signaling through TLR4 modulates innate immune activation in human macrophages and the biology of hepatic stellate cells. J. Leukoc. Biol. 100: 599–606.
. 1988. Evolution of B cell lineage lymphomas in mice with a retrovirus-induced immunodeficiency syndrome, MAIDS. J. Immunol. 140: 1123–1131.
. 1998. Evidence for a continued requirement for CD40/CD40 ligand (CD154) interactions in the progression of LP-BM5 retrovirus-induced murine AIDS. Virology 241: 260–268.
. 1970. Plaque assay techniques for murine leukemia viruses. Virology 42: 1136–1139.
. 1989. Further evidence that BALB/c and C57BL/6 gamma 2a genes originate from two distinct isotypes. EMBO J. 8: 3245–3251.
. 1998. Defective TCR expression in transgenic mice constructed using cDNA-based alpha- and beta-chain genes under the control of heterologous regulatory elements. Immunol. Cell Biol. 76: 34–40.
. 1991. The primary B cell response to the O/core region of bacterial lipopolysaccharide is restricted to the Ly-1 lineage. J. Immunol. 146: 327–331.
. 2002. Transitional B lymphocyte subsets operate as distinct checkpoints in murine splenic B cell development. J. Immunol. 168: 2101–2110.
. 1999. B cell development in the spleen takes place in discrete steps and is determined by the quality of B cell receptor-derived signals. J. Exp. Med. 190: 75–89.
. 2016. Defining antigen-specific plasmablast and memory B cell subsets in human blood after viral infection or vaccination. Nat. Immunol. 17: 1226–1234. 2010. Metabolism in T cell activation and differentiation. Curr. Opin. Immunol. 22: 314–320. 1956. On the origin of cancer cells. Science 123: 309–314.
. 2014. Metabolic reprogramming is required for antibody production that is suppressed in anergic but exaggerated in chronically BAFF-exposed B cells. J. Immunol. 192: 3626–3636.
. 2017. Gsk3 is a metabolic checkpoint regulator in B cells. Nat. Immunol. 18: 303–312.
. 1985. Retroviral induction of acute lymphoproliferative disease and profound immunosuppression in adult C57BL/6 mice. J. Exp. Med. 161: 766–784.
. 1999. The role of TGF-β in growth, differentiation, and maturation of B lymphocytes. Microbes Infect. 1: 1297–1304.
. 2008. Characterization of a late transitional B cell population highly sensitive to BAFF-mediated homeostatic proliferation. J. Exp. Med. 205: 155–168.
. 2008. Regulation of B-cell entry into the cell cycle. Immunol. Rev. 224: 183–200.
. 2008. Caspase 6 regulates B cell activation and differentiation into plasma cells. J. Immunol. 181: 6810–6819.
. 1993. In vivo CD40-gp39 interactions are essential for thymus-dependent humoral immunity. I. In vivo expression of CD40 ligand, cytokines, and antibody production delineates sites of cognate T-B cell interactions. J. Exp. Med. 178: 1555–1565.
. 1994. The expansive role of CD40 and its ligand, gp39, in immunity. Semin. Immunol. 6: 259–266.
. 2015. Scaffold protein JLP is critical for CD40 signaling in B lymphocytes. J. Biol. Chem. 290: 5256–5266.
. 2003. Down-regulation of CD20 on B cells upon CD40 activation. Eur. J. Immunol. 33: 2398–2409.
. 2001. Characterization of the CD154-positive and CD40-positive cellular subsets required for pathogenesis in retrovirus-induced murine immunodeficiency. J. Virol. 75: 3581–3589.
. 1996. Antibody to the ligand for CD40 (gp39) inhibits murine AIDS-associated splenomegaly, hypergammaglobulinemia, and immunodeficiency in disease-susceptible C57BL/6 mice. J. Virol. 70: 2569–2575.
. 2004. CD40-associated TRAF 6 signaling is required for disease induction in a retrovirus-induced murine immunodeficiency. J. Virol. 78: 6055–6060.
. 2014. The pentose phosphate pathway and cancer. Trends Biochem. Sci. 39: 347–354.
. 2011. Metabolomics of B to plasma cell differentiation. J. Proteome Res. 10: 4165–4176.
. 2014. Glucose-dependent de novo lipogenesis in B lymphocytes: a requirement for atp-citrate lyase in lipopolysaccharide-induced differentiation. J. Biol. Chem. 289: 7011–7024.
. 2011. CD4(+)CD25(+)Foxp3(+) regulatory T cells promote Th17 cells in vitro and enhance host resistance in mouse Candida albicans Th17 cell infection model. Immunity 34: 422–434.
. 2011. Foxp3(+) regulatory T cells promote T helper 17 cell development in vivo through regulation of interleukin-2. Immunity 34: 409–421.
. 2017. ‘Repair’ Treg cells in tissue injury. Cell. Physiol. Biochem. 43: 2155–2169.
. 2017. Interleukin-10 from CD4+follicular regulatory T cells promotes the germinal center response. Sci. Immunol. 2: eaan4767.
. 2001. Impaired IL-15 production associated with susceptibility of murine AIDS to mycobacterial infection. J. Leukoc. Biol. 69: 138–148.
. 1992. Dissemination of enteric Mycobacterium avium infections in mice rendered immunodeficient by thymectomy and CD4 depletion or by prior infection with murine AIDS retroviruses. Infect. Immun. 60: 4747–4753.
. 1992. Modification of resistance to Streptococcus pneumoniae by dietary ethanol, immunization, and murine retroviral infection. Alcohol. Clin. Exp. Res. 16: 846–851.
. 1995. Effect of a retroviral immunodeficiency syndrome on resistance to MCMV: a role for natural killer cells. J. Acquir. Immune Defic. Syndr. Hum. Retrovirol. 10: 120–128.
. 1996. Efficacy of BMS-180194 against experimental cytomegalovirus infections in immunocompromised mice. Antiviral Res. 29: 233–241.
. 1997. Effect of a retroviral immunodeficiency syndrome on murine cytomegalovirus-induced hepatitis. Am. J. Pathol. 150: 1089–1100.
. 1999. The role of IL-12 in the control of MCMV is fundamentally different in mice with a retroviral immunodeficiency syndrome (MAIDS). Immunol. Cell Biol. 77: 131–138.
. 2002. Selenium supplementation decreases coxsackievirus heart disease during murine AIDS. Cardiovasc. Toxicol. 2: 53–61.
. 2013. T-cell reconstitution during murine acquired immunodeficiency syndrome (MAIDS) produces neuroinflammation and mortality in animals harboring opportunistic viral brain infection. J. Neuroinflammation 10: 98.
. 1997. Cryptococcus neoformans infection in mice previously infected with LP-BM5 MuLV, the agent of murine AIDS (MAIDS). Clin. Exp. Immunol. 110: 196–202.
. 2000. Lanoconazole, a new imidazole antimycotic compound, protects MAIDS mice against encephalitis caused by Cryptococcus neoformans. J. Antimicrob. Chemother. 46: 443–450.
. 1992. Retrovirus-induced immunodeficiency in mice exacerbates gastrointestinal candidiasis. Infect. Immun. 60: 4168–4178.
. 2000. Glycyrrhizin improves the resistance of MAIDS mice to opportunistic infection of Candida albicans through the modulation of MAIDS-associated type 2 T cell responses. Clin. Immunol. 95: 145–155.
. 1992. Opportunistic infections and retrovirus-induced immunodeficiency: studies of acute and chronic infections with Toxoplasma gondii in mice infected with LP-BM5 murine leukemia viruses. Infect. Immun. 60: 4394–4401.
. 1993. Toxoplasma gondii: induction of toxoplasmic encephalitis in mice with chronic infection by inoculation of a murine leukemia virus inducing immunodeficiency. Exp. Parasitol. 76: 39–45.
. 1999. Immune CD8(+) T cells prevent reactivation of Toxoplasma gondii infection in the immunocompromised host. Infect. Immun. 67: 5869–5876.
. 1993. Alcohol and murine acquired immunodeficiency syndrome suppression of resistance to Cryptosporidium parvum infection during modulation of cytokine production. Alcohol. Clin. Exp. Res. 17: 539–544.
. 2008. Lymphotoxin-mediated crosstalk between B cells and splenic stroma promotes the initial type I interferon response to cytomegalovirus. Cell Host Microbe 3: 67–76.
. 2006. Obligatory requirement for antibody in recovery from a primary poxvirus infection. J. Virol. 80: 6339–6344.
. 2015. Protection against Streptococcus pneumoniae lung infection after nasopharyngeal colonization requires both humoral and cellular immune responses. Mucosal Immunol. 8: 627–639.